The 9814 Change Parts hold a necked-in can in place as it is being compressed. 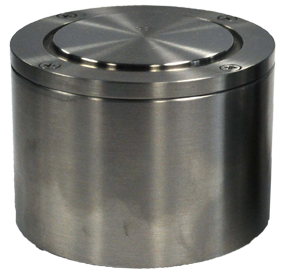 The 9814 consists of a can locator with centering pin and an optional locator extender for use with a second height of can. The 9814 Change Parts are designed and manufactured to fit the neck contour of the sample EXACTLY in order to prevent neck failure during testing of the sample's side wall. The 9814 is ordered by specifying detailed information on the appropriate Customer Order Guide. The Customer Order Guide includes a cross-sectional diagram of a beverage can neck; the customer uses this diagram to provide to Altek specific sample information such as neck and flange contours and dimensions. This change part is used with ALTEK Models: 9221CA2 ; 9221CA3 ; 9221DA3 ; 9221DA4 ; and 9221DA5.